The San Jose Sharks are doing just about everything right these days. While their mediocre start in the standings isn’t exactly the sparkplug start they were hoping for, the lineup they have taking the ice each and every night is hard to ignore – especially with the addition of Erik Karlsson. On top of that, they seem to be having a genuinely good time. Have you heard of their #SharksForLife commercials? If not, check out each and every one of them. The Teal Appeal is Real with their jerseys too, and those jerseys were spun in an extremely cool way to create the coolest warmup jerseys of all time. 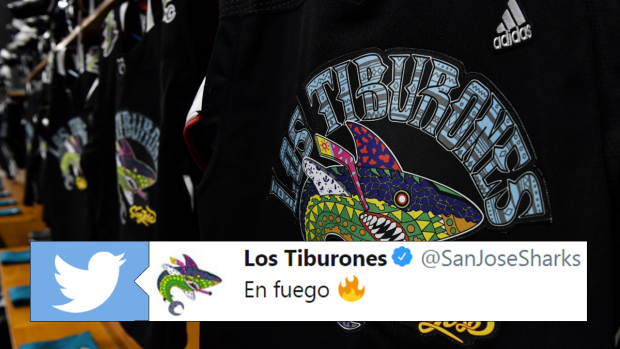 Tiburones is Spanish for Sharks, and the jerseys are a celebration of Hispanic Heritage Night. They were designed by Mexican street artist SPAIK. Fans are appreciative of the wicked jerseys, something that is becoming a trend for Hispanic Heritage Night. Last year they wore Hispanic themed jerseys that rival these in style.